Salt Lake City commercial properties can fall victim to property crime and theft any time of the year. With the increase of burglaries in recent months, many commercial property owners may be curious about their options. Due to the nature of smash-and-grabs, they’re not really preventable with security systems and cameras alone. In order to truly have a preventative measure that can deter smash-and-grab burglaries, commercial property owners need to consider safety window film. Safety window film is an affordable solution that acts as a passive security system, providing comprehensive defense in these circumstances. Safety window film acts as a strengthening system for your existing glass, providing various commercial properties an excellent way to defend against smash-and-grabs. By making it exceedingly more difficult for intruders, assailants, and burglars to gain access to your property, this in itself usually deters crime. The commotion and noise created by someone trying to break through safety film draw unwanted attention and takes considerably more time than unprotected glass. Safety window film also mitigates broken glass hazards during natural disasters, freak accidents, and other circumstances in order to protect building occupants and any valuables you may have. Cleanup after an event is also much easier since the broken glass remains held together by the safety film, helping lower operational downtime. 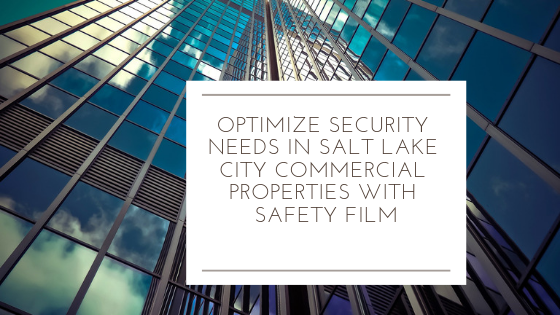 3M™ Safety & Security Film S140 Demonstration for Salt Lake City Commercial Properties from Kansas City Green Window Film on Vimeo. GreenLight Window Films is honored to provide our illustrious security assessment for your commercial property. We’ll complete the assessment on-site to really analyze the property vulnerabilities and strengths. With the most extensive selection of safety films, we can help you find the perfect investment for protecting your business. Safety film can also have energy efficiency, UV blocking, and privacy properties, helping you save. For more information regarding safety window film, please contact us!